The China Study used a broad comparison of different diets and living styles across diverse regions of China to answer questions about diet and disease. The authors’ bottom line is that eating animal protein leads to the high rates of cancer and heart disease, and many other afflictions of the Western world as well. They cite evidence that dairy is as bad as meat – worse in some respects, and they counsel a vegan diet. They have written an engaging book and make a compelling case, but why have so many studies before and since missed the connections that loom so large in the China Study? Colin and Thomas Campbell are a father-son team from Cornell who have used epidemiology to answer the question, what diet is best for human health and longevity? There are a lot of things they get right. First, epidemiology is far more compelling than animal studies or lab results or biochemical theory. Epidemiology looks at humans long-term, in settings that reflect the way people actually live. Epidemiological studies are based on correlations between behaviors and disease or behaviors and mortality, relating the choices we make to what happens to us. But in a science experiment, you like to have controls: two experiments that are run identically in all respects, except that one thing is changed. With people in their natural habitat, you have to give that up. No two people are alike, and no two groups of people differ in one respect only. Epidemiologists know this well, and they seek to bridge the gap (1) by constructing groups that are as much alike as possible, (2) by collecting data for large numbers of subjects, and (3) by using sophisticated mathematics to tease apart the possible causes for different outcomes. The Campbells do all this well. They chose 65 counties in China because the population tended to stay put and maintain similar habits over decades, and because the Han people are genetically similar. They sent teams out to collect blood and vital stats from 6500 volunteers, and they visited each family to observe first-hand what they were eating, rather than rely upon questionnaires. One thing in their design about which I’m more skeptical: they started with 367 factors that we wished to study, and a large number of health outcomes. People who do multi-factorial statistics often don’t realize that the number of possible causes rises rapidly with the number of variables. Even five variables cannot cannot be meaningfully separated, and 367 is ridiculous. But in the end, they limit their conclusion to broad-stroke conclusions about animal- vs plant-based diets. A more essential limitation is that they have bet the farm by including dairy along with meat in their conclusions. The problem here is that only three of the 65 counties had any dairy at all in their diets, and zero relied primarily on dairy for protein. The Campbells supplement the China Study with lab rat studies and cross-country comparisons to fill this gap, but the result is much less convincing just because countries vary in so many cultural and genetic and environmental ways that different parts of China do not. Even meat consumption in rural China is nothing like meat consumption in the West. There is no part of China that consumes beef in quantities typical of Texas or Argentina. The core methodology of the book is so strong, but then the principal conclusion is derived from a methodology that is more circumstantial. This is a kind of bait-and-switch, which does not invalidate the Campbells’ thesis, but certainly opens doors for doubt. 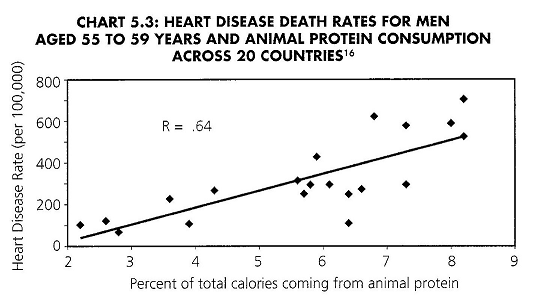 Here’s a plot from Chapter 5, showing that countries with higher consumption of animal protein tend to have higher rates of death from cardiovascular disease. One problem with this evidence is that the same countries with high animal protein consumption also eat more saturated fats, and more fat in general. You could draw a nearly identical plot averring that it was fat intake and not animal protein that causes heart disease. The core of the book is in statistical excerpts from the Study, in Chapter 4. Rats are fed protein from casein, a dairy source. Some of the rats are on a 5% protein diet, others on a 20% protein diet. Both groups are challenged with aflatoxin, a potent carcinogen. None of the low-protein rats got cancer; but all the high protein rats contracted cancers. In America, the (age-adjusted) death rate from coronary heart disease is 17 higher than the corresponding rate in rural China. Szichuan and Guizhou had extraordinarily low levels of CHD in middle-aged men, (even for China). What are they doing right? These areas had some of the lowest meat consumption levels. Compared to Western diets, the China study was comparing low animal protein with lower animal protein. Still, a robust association of animal protein with blood cholesterol and cancer were found, even at very low intake levels. Chinese fiber intake is three times as high as in America (33 vs 11 g/day). Fiber decreases residence time of food in the GI track, and also absorbs and eliminates toxins as well as nutrients. The Campbells propose that this is part of the explanation for lower cancer rates in China. Chinese women have half the estrogen levels of US and British women, and their reproductive lives are shorter at both ends. Lifetime exposure to estrogens is less than 40% that of American women. The Campbells propose that this is a factor in the lower breast cancer rate in China – less than 1/5 the American rate. The Campbells propose that (1) even the least active Chinese are more active than the average American, and (2) higher proportion of complex carbs compared to protein and fat in the diet signals the body to store fewer calories as fat. A whole section of the book is devoted to the association between cow’s milk and auto-immune diseases. Childhood diabetes is much more prevalent in children who are weaned early from breast milk to cow’s milk. Much of the research for this book took place more than twenty years in the past. It is an intriguing thesis that the Campbells raise, and the notion of a vegan advantage seems intuitively attractive. But there is a lot of direct evidence that the Campbells fail to address. Some of it involves epidemiological comparisons that are able to address more directly the difference between high-dairy and low-dairy diets. Some of it does not support the Campbells’ powerful thesis. I was left feeling that they have opened a useful window, but they have not fairly summarized the diversity of evidence on vegan diets. Yes – they’re far more devastating than my criticisms of China Study. I don’t know which is more devastating, the criticism , or the humor in which it is delivered. I find it interesting that these weak criticisms of the China Study keep popping up. Yet today there so much more evidence that a plant based diet is the only diet which does not cause long term degenerative diseases in humans. In fact a healthy plant based diet can cure most of the degenerative diseases from Arthritis to Diabetes, and even Cancer. We now know thanks to more recent long term studies, that People who eat plants live on average 10 years longer than those who eat animals. Plant eaters also are healthier and do not suffer from dementia or Alzheimers at the rate Animal eaters do. It is also well documented that when people from countries with low chronic disease rates like China and Japan move to the US and adopt the western diet. They also start developing the Western Diseases that go along with it. I realize there is a whole cottage industry of Science deniers out there, shilling for the established industries. I am sure they are well paid for their time and they have confused a lot of people. However The Science is overwhelming in the area of nutrition. Plants provide all the protein we need. There is nothing in Meat that the body can not get from Plants. There is considerable evidence that even the B12 in meat is not bio-available. Today it is clear, the only reason left for eating meat is if you want to risk dying from some horrible preventable disease. These studies are hard to do, because you can’t put people in cages where you control every variable except diet. Retrospective studies are always confounded by self-report bias and by our inability beforehand to know what variables are relevant. Your statement that “people who eat plants live on average 10 years longer” is news to me – I would look very carefully at the methodology on which it is based. Reference? Just in case anyone is interested here is an article on plant based diets and cancer risk. I think it all comes down to the fact that a meat/dairy diet is twice as high in the sulfur containing amino acid methionine, as well as the sulfur containing amino acid cysteine. We have known from the 1930’s that a calorie restricted diet will increase life expectancy in almost all animals by up to 40%. By restricting fats, carbohydrates, and proteins in separate experiments, they narrowed it down to a protein restricted diet increases life expectancy. Further experiments with restricting individual amino acids showed that restricting methionine increases life expectancy. So a vegetarian diet with half as much methionine is just like a calorie restricted diet with half the normal calories. A vegas diet should increase life expectancy and have the same positive results with regard to diseases. Methionine is the first amino acid (start) for every protein; so even a vegan diet will supply sufficient methionine, just half as much. What is it about methionine that makes it poisonous? Methionine is one of only 2 amino acids containing sulfur. Somehow methionine increases the release of free radicals in mitochondria, damaging the mitochondria which leads to less ATP production, which leads to a loss of energy throughout the cell; so there is less cellular repair, and the cell will eventually die from lack of sufficient ATP. It is just my idle speculation but since mitochondria have sulfur in one of their complexes, I suspect an electron from the sulfur in mitochondria gets transferred to the sulfur in methionine, and thereby gets released as a free radical. I really enjoyed this article and the research done by the people who wrote this extensive book. I do want to point out that veganism in its true definition is a total rejection of speciesism and the oppression of other sentient living beings by humans. Because the principal study included experiments with rats, I think it is not so much a book that gives voice to what veganism really is but rather a voice for the health benefits of a vegan diet. I think this is an error that’s very important to understand as the misusage of the word ‘veganism’ is very common and part of an oppressive human culture. It’s completely disregarded the animal rights movement and the experiences of advocates and vegans who are misunderstood and misconstrued. Very much like how the word ‘feminist’ and other words in history have been redefined or clearly censored due to a lack of awareness or rejection of a minority’s experiences and beliefs, the word ‘vegan’ is also being misused inappropriately in this case. I hope you understand where I’m coming from and how I’ve made these connections. I do really enjoy your blog and the articles you write are always filled with passion and interest.